The Concrete Tectonics studio taught by Kirsten Orr in the UTS Master of Architecture is allowing students to experiment with innovative architectural approaches to precast concrete. Concrete is one of the most ubiquitous materials in contemporary building practice yet the way it is currently produced and deployed in the built environment poses serious environmental, technological and formal problems. Students are investigating new ways of casting concrete that minimise the environmental impacts of formwork (both the material and its fabrication) and that maximise the possibilities for producing mass-customised, tectonic concrete elements. Emphasis is placed on hands-on experimentation in the workshop, with students testing a variety of casting techniques including fabric membranes, hot-wire cut Expanded Polystyrene foam blocks, and laser cut Polyethylene Terephthalate (PET) sheets. 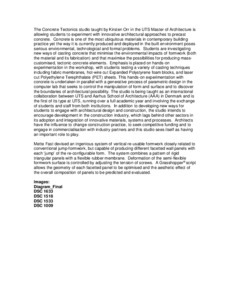 This hands-on experimentation with concrete is undertaken in parallel with a generative process of parametric design in the computer lab that seeks to control the manipulation of form and surface and to discover the boundaries of architectural possibility. The studio is being taught as an international collaboration between UTS and Aarhus School of Architecture (AAA) in Denmark and is the first of its type at UTS, running over a full academic year and involving the exchange of students and staff from both institutions. In addition to developing new ways for students to engage with architectural design and construction, the studio intends to encourage development in the construction industry, which lags behind other sectors in its adoption and integration of innovative materials, systems and processes. Architects have the influence to change construction practice, to seek competitive funding and to engage in commercialisation with industry partners and this studio sees itself as having an important role to play. Mette Fast devised an ingenious system of vertical re-usable formwork closely related to conventional jump-formwork, but capable of producing different facetted wall panels with each ‘jump’ of the re-configurable form. The system combines a pattern of rigid triangular panels with a flexible rubber membrane. Deformation of the semi-flexible formwork surface is controlled by adjusting the tension of screws. A Grasshopper© script allows the geometry of each facetted panel to be optimised and the aesthetic effect of the overall composition of panels to be predicted and evaluated.